The Lido is an 11 km long barrier island, accessible via a 15-minute vaporetto ride from Venice. Home to 20,000 residents, the island is home to the Venice Film Festival, the main settlement of Malamocco in the center alongside the casino and two fancy hotels, and a golf course on the south of the island. For runners, the Lido provides an opportunity to uncork and enjoy a bucolic jaunt away from Venice’s congestion and crowds. Nearly 2/3 of the main road across the island is right along the water and features separate paths for walking or a good sidewalk. There are great views of the lagoon and Venice on the western side and of the Adriatic on the eastern side. Best sections for running are the 3 km in the south from Alberoni to Malamocco; from the vaporetto terminal north to the end of the island on Riviera Santa Maria Elisabetta/S. Nicolò (2.3 km); and the Lungomare Guglielmo Marconi on the eastern side, paralleling the beach for 3 km. To see some of the island’s shops, restaurants, and hotels, the wide Santa Maria Elisabetta leads the 700m from vaporetto stop to the beach on the other side of the island. 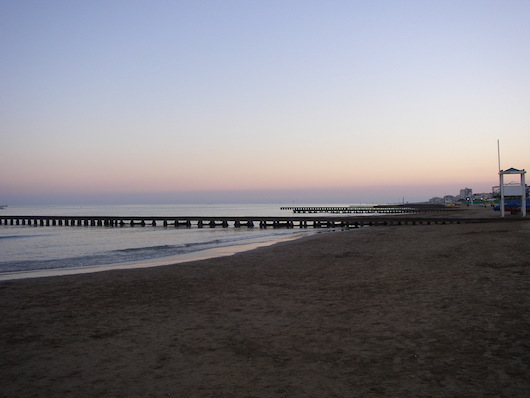 A beach along the Adriatic runs much of the length of the Lido. It’s not the perfect beach for running, but it is runnable, especially right next to the water. Some of the beach is private, but the two large public beaches (northern and southern side of the island) are long enough for a good run — but they can get very crowded! Up to 15 km including pier at northern end. We've mapped out some specific sections too.